When my friend Brian handed me A Supposedly Fun Thing I’ll Never Do Again and told me I had to read it, I immediately recognized the name of the author whose story “The Depressed Person” was featured in Harper’s magazine: David Foster Wallace. “Oh yeah, I want to read more of this guy.” When I returned the book, Brian then told me I had to read Infinite Jest. Not wanting to deprive him of his unread copy (NB: Brian has still never read Infinite Jest), I went to my local library in downtown Lexington KY and checked out the book. Fortunately, no one was on a waiting list, so I got more than the standard number of renewals. I remember reading a lot of the book lying in my bed (like Gately in the home stretch of the book), flipping back to try and keep all the plot threads and chronologies straight, and then giving up on that about page 200 or so and just enjoying it. I remember being thankful that I was sick in January 2001 so I could read large chunks of the book instead of going to work. I remember sitting and reading at this very table that my wife hates (transferred to Morehead KY solely as a frugal gesture) and being utterly blown away by the Eschaton section. After Gately got shot, I would only put the book down to go to work or to the bathroom or to sleep. With two days to go, if you are still sticking to a pages-per-day schedule, I just don’t see how you’re doing that. Reading Infinite Jest was the most extraordinary reading experience of my life. I find the depth of the last sentence to be unparalleled in literature. Only the endings of Ulysses and Beloved come close to affecting me so profoundly. Thankfully in that sentence, Wallace leads Gately and us out of the hell of that last sequence into a transcendent moment of peace, cold and fleeting but also unbearably beautiful, striking a chord of sadness that still rings deep inside me. After I finished the book, I could not stop thinking about it. I knew that Infinite Jest was immaculately structured and cohesive, and I wanted to figure out how to articulate Wallace’s achievement. Finally for Christmas 2001 I ordered a remaindered copy of the hardcover from Hamilton Books for about $4 and had it delivered to my in-laws’ house. I wrote numbers 1-28 (and an N) in the shadowed circles of that copy and numbered all the sections. I was given a scrap of paper (in the home of my mother-in-law’s late parents, whose inheritance has just helped us purchase our first home, a home that this hated table will never see) and sketched out a diagram with notes that would become, over the next six years, the 512-page book, Elegant Complexity. Without the daily inspiration of Wallace-l and The Howling Fantods, I might not have finished the task. Four days before my glorious daughter was born, Matt Bucher said he and his brother John wanted to publish Elegant Complexity (and for the record, that perfect title is actually Matt’s). Because they published that book, I got invited to submit an article to the Sonora Review and to attend a tribute event for Wallace in Arizona, where I met people Wallace knew and loved. I got invited to speak on talk radio in Ireland. I was invited to be the keynote speaker for the Consider David Foster Wallace conference in Liverpool and got to take my first trip to Europe. Matthew Baldwin invited me to contribute the very thing you are reading right now. Reading Infinite Jest changed my life. Since finishing Infinite Jest, I have read just about everything Wallace has ever written and have also been motivated to read Barth and Pynchon and an author I’d never heard of, William Gaddis. It is a crime that Gaddis is not as revered an American author as Faulkner or Hemingway or anybody you want to name. I have been motivated to read a 600-page anthology of Modern and Postmodern philosophy (although it took me 14 months). I ordered a Vollmann anthology after reading a Wallace interview. As my wife reminded me when I read this to her, I don’t get nauseous anymore, only nauseated. I own and frequently consult Garner’s Modern American Usage, a treasured gift from my mother-in-law. I tell my students (and everyone else, too) that not using that final serial comma before the conjunction is just insane and irresponsible. I think This Is Water is one of the most amazing, beautiful things I’ve ever read and am considering just taking entire class periods at the end of the semester to read it to students. When I want to be a jerk in public, the phrase “this is water” runs through my head and I get calm. Reading Infinite Jest changed my life, and now it’s going to change yours. I promise you. Congratulations to everyone who has participated in Infinite Summer. I’m right there with you regarding Gaddis. Thanks for Elegant Complexity and for this. IJ has changed my life in some of the same ways, most notably in terms of influencing the sorts of things I now enjoy reading that I might never otherwise have been turned on to. Thank you Greg, for this, and for EC you sent me. I’m now more than ever, excited to read this. The only crime in this post is that my copy of IJ is at home, and I want to reread that last sentence now more than I did when I read it for the first time. Great post, Mr. Carlisle. What was the 600 page tome of modern/postmodern philosophy that you read? Like Peter Knox, I also regert that I have to wait until I return home to reread the final sentence. That’s especially true in that you’ve given it a different perspective than I had on both my first reading and the one that concluded this past Monday. I found myself slowing my pace repeatedly over those last pages attempting to prolong the moment as much as possible realizing how sad I was to see it coming to and end once again. I want more……not so much to get more of the story as to simply get more of Wallace. It will be even sadder to reach the end of The Pale King with the knowledge there never will be more. But then this is water. It took three times looking to notice it at the wrist, but “…” indeed. That would be my tattoo. I had some minor swelling for the first few days, and the photo was taken shortly after receiving the tattoo. Here’s a slightly better pic, with less swelling. You’d be suprised at how difficult photographing can be, well, without it looking crooked and weird and not quite right. er – “how difficult photographing a tattoo can be” is how it should read. I know what you mean about the difficulty of photographing tattoos! That’s why I haven’t posted any pics of my IJ tattoo… But I’ll try to fix that soon. It’s the grave-digging scene sort of as described in Gately’s dream/hallucination, with Joelle asking “did you know him” as a pantiless angel, Hal holding Himself’s head yelling too late… Instead of eating food, I have Gately digging and being unresponsive to Hal. I took a few liberty’s with color and description of character’s…. Also have a fish with the word’s “This is water” on the wrist…. The start of a full DFW sleeve! Hopefully I will get good photos soon and I can post them somewhere! I do often wonder what Tiny Ewell would say about my tattoo, ha! I’ve got one too. It’s a little shiny here. 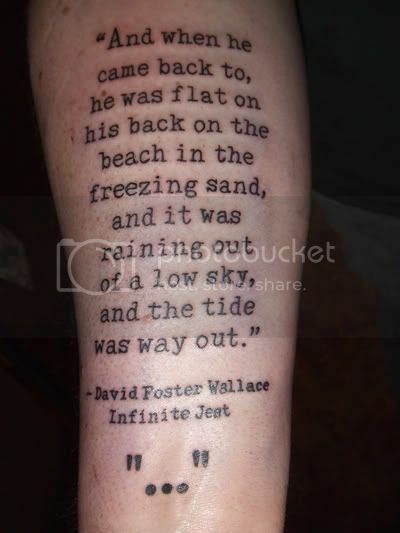 I want to see this DFW sleeve described below. Thanks so much for your huge contributions! I have a lot of DFW left to read. Many of you must be very jealous of me, to have so much new DFW in front of me! Terrific post Greg. I just finished reading IJ this evening and I went back and re-read the first few pages. In the last few weeks, I deliberately slowed down because I didn’t want to finish the book. But like many people have noted, you’re almost careening down a hill towards the end and it’s nearly impossible to stop. To me, Infinite Jest is a haunting book — I’d have dreams about characters when I was reading book — and it is a book that enriches you. You somehow feel that Wallace has connected with you at an emotional/intellectual level in a way that you never thought was possible with a book. Already, a change I’ve noticed is that I’ve never been a reader of literary fiction, but this book has gotten me thinking about reading the more – for lack of a better word – serious, literary works. Thanks for sharing a compelling bit of your personal experience with IJ and DFW. An awful lot of us are having our own unique, but remarkably parallel adventures. And it’s in no small part a result of the tireless efforts you (and the many other DFW devotees involved w/ #infsum) have made to engage a wider public in the discussion and study of his work. It speaks far more eloquently than I ever could to the larger cultural moment in which the Infinite Summer story has unfolded. Thank you for this post and for your book. Not the intended result, but this post made me cry. Between nodding with every sentence and the humanity of the table…sigh. Infinite summer has been such a gift—I was so alone in my awe of Wallace’s prose, of Garner’s gentle logic, of an existence of something that has come after postmodernism before this summer. Yay to people like you and Matt and Nick and others who have just maintained a steady hum until the din is deafening and the academy is listening. I was laughed at 10 years ago when I wanted to write a dissertation on Infinite Jest. I think now I might try again. And I might be the only one, but the last line of the novel still enrages me. I’m used to fluctuating between adrenaline and giggles, 1000 pages worth. And all I get is one brief breath and you END it?! Talk about waiting to exhale. Beautiful and torturous—a sort of case in point. Anyway, thanks for the post. And the cathartic cry. Always love those. Yeah– that last sentence gives me chills every time I think about. I think it’s been ingrained into my central nervous system. ^ And those grammar mistakes kind of embarrass me in the context of all this. Great post, Greg. And I loved “Elegant Complexity” when I read it last October/November. Keep up the great work. Oh, and what you had to say in Sonora Review, excellent stuff. I’m still not sure what to make of the Sept 12, 2008 connection you bring up at the end of your piece. You’ve got, on the one hand, Don Gately’s first day of sobriety — 9/12/08 — and on the other hand, in the real world, you’ve got this horrible event. That is, I take it that IJ’s concluding scene is also a glimpse of Don G’s first day of sobriety. Was DFW thinking of this scene on 9/12? Was 9/12 a personally important date to him? Perhaps his own day of sobriety? Who knows. But what a haunting image: low sky, distant tide. Thanks again, Greg, for your IJ benediction. Thank you to everyone who has participated in this project, in one way or another. When I say that my life has been changed, for the better, I assure you that I mean it how DFW would have wanted: sincerely. I have a hardcover 6th printing. The last page of the novel is Page 981. In my copy there is a semi-circle in the very bottom right-hand corner of this page. It is not the same size or design of the circles (annular whatevers? )used as dividers in the text. Is this a happy synchronicity or does it appear in other printings? If so, could this be the hole at the center of the Sierpinski Gasket? Is it limiting or is it expanding the text? Greg, I’m delighted to read that you also found the last line to be so moving. I hadn’t expected it to have the impact it did on me. Like many readers, I had peeked at it and wondered what on earth was going to lead up to it. The stark contrast with the preceding scenes is amazing to me, and beautiful as well. 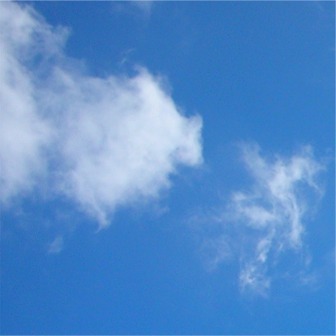 There are, of course, many ways to interpret it, but for me it conveys an amazing sense of peace. A new beginning. Gately, washed clean by the cold water and given a chance to find safe passage to Ennet House. Life changing? I think so. Having just finished the book this past week, I keep thinking of it over and over. I know that this book has had a profound effect on me, one that hasn’t yet sunk in. Thanks for sharing similar feelings. I look forward to reading Infinite Complexity. Well, I just finished IJ on my Kindle, and while I was not inspired to get a DFW quote tattoo, I was galvanized to get a paperback copy of the book so I could immediately start reading it again, this time more slowly, this time with lots of annotations in red ink and bookmarks and post-it notes aflutter. I believe I will be reading this amazing book for a very long time. Yes. Yes, yes, yes. I became like a rat pressing the pleasure-lever. It was impossible to move or speak. People around me seemed ghostly, spoke in hushed voices. The confines of the physical book ate me whole. My eyes grew so big it was like they were trying to swallow the page of print, even blurred through tears. The unparalleled reading experience which I suspect some of us have sought and re-sought since we were very small children and discovered what the Entertainment had to offer. And I think, too, of that person who always confused “further” and “farther” until, in the margins of one of his papers, DFW wrote, simply, “I hate you.” And now I do not confuse them. Thanks Greg. EC was my companion to IJ, section by section, and as much as the text affected me I never would have gotten as much out of it as I did with your astute analysis bouncing around in my skull too. Now that I’ve “came back to” (p. 981): The ending makes a interesting–and good–impression on me. I’m with it all the way. At first I thought of the very beginnings of us as land animals crawling out of the ocean–so a representing a beginning. We’re ready to remake the world now that this other world has ended and another begins. The border aspect–Gately on the border between land and sea– figures strongly here. The end of the story as well as the imagery in it’s last sentence is a jumping off place–into a being-without-the-book, if you will, being-outside-the-book into our being alone with ourselves again into well, just being. Yet, “in my end is my beginning”-style there are the footnotes, a running commentary on the being, the content of the book just as when we are alone with our being our thoughts should, in the sense of the observing ego, be a running commentary on our being/actions–thereby keeping us from the dreaded “default setting”. I think it’s brilliant that it’s cold and raining because as the book and it’s world leaves me, it does feel like warmth and life are now withdrawing in the opposite direction and I have no choice but to plunge forward over that border into being and start swimming. Great contribution to belles-lettres, Prof. Carlisle. I wish I could be in your classes.